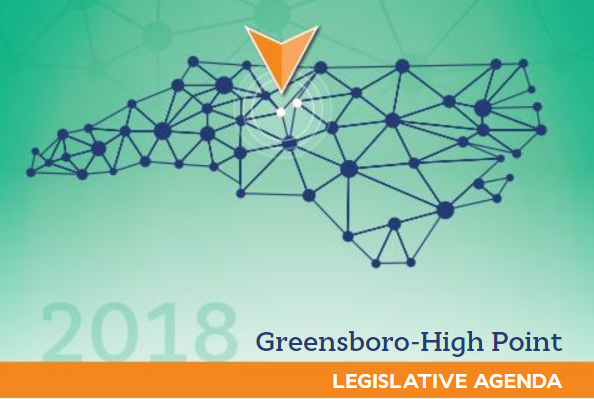 Prepared each March, the Triad Legislative Agenda (TLA) is a collaborative document between the Greensboro Chamber of Commerce and Business High Point - Chamber of Commerce to advocate for state funding of key initiatives critical to the continued growth of Guilford County. TLA is an effective effort to encourage our local representatives in Raleigh to stay informed on important economic and community projects that if properly funded, advance Greensboro, High Point, and Guilford County. From advocating the General Assembly to support the High Point Market or the formation of the Lexington Avenue gateway to better connect the two communities, or promoting workforce development programs and further supporting aviation courses, a great deal is advocated for by our two organizations in support of regional development and prosperity.